2018 is a special vintage for Paraduxx as it commemorates our 25th harvest! So, we sat down with winemaker Don LaBorde to chat about our 25-year history, evolution and inspiration from the great blends of the world. Can you walk us through Paraduxx’s origin and evolution? Dan Duckhorn was truly intrigued with the Super-Tuscans (Sangiovese) and Vega-Sicilia’s (Tempranillo) coming out of Italy and Spain. He appreciated how these regions began blending their native varietals with a Bordeaux grape and effectively pioneered a new winemaking style. 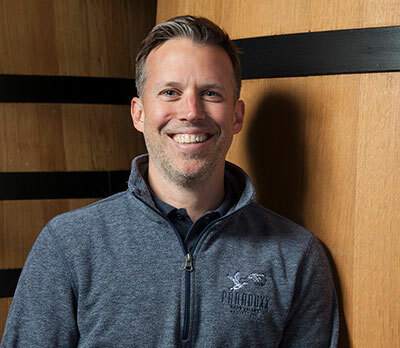 “Dan’s thinking was let’s create our own new category,” using what could be called California’s closest thing to a native grape, Zinfandel blended with Cabernet Sauvignon. In, 1994 we released our inaugural vintage, which blended Cabernet Sauvignon, Zinfandel, Merlot and Petite Sirah. How would you describe our series of wines today? What makes the Paraduxx Style unique? How is the 25th Harvest turning out? “At Paraduxx, we are a month late! The quality is there, the crop is above average, which is probably why it is a little late too, it’s taking awhile to ripen up. 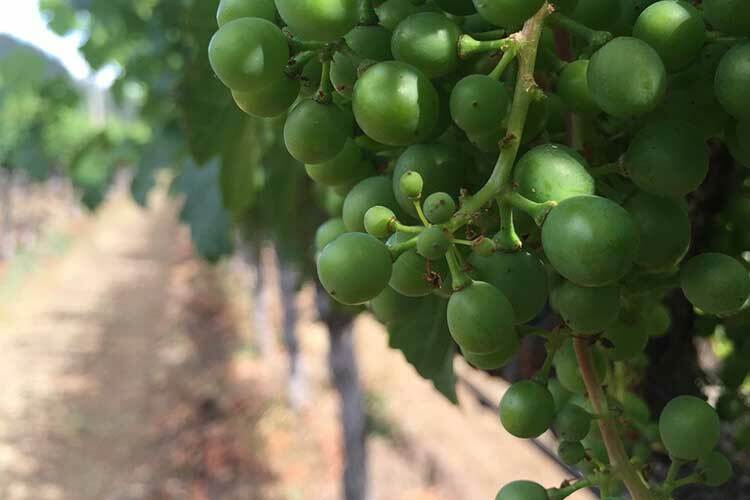 The weather has been cool, and we’ve had one rain event; overall we have really nice flavor development in the grape.” In comparison to last year, we had numerous heat spikes early in the harvest season, but this vintage and 25th Harvest we are seeing slow and even ripening, so far everything tastes amazing. We celebrated with our storied 25th Harvest with our annual Harvest Party uncorking the release of the pinnacle of our portfolio, the 2015 Paraduxx Napa Valley X2. To decant or not to decant, that is the question! At its most basic to decant simply means to transfer the contents of a bottle of wine into a new vessel. For this process to be most beneficial the decanter will be larger and have more surface area than the original bottle. Okay, but why do this? Fundamentally, decanting serves two purposes: to separate a wine from any sediment that may have formed and to aerate a wine enhancing its aromas and flavors creating more vibrancy before serving. Decanting is most associated with the service of older wines but, conversely, younger wines can also benefit from this step. At the core of the matter decanting allows the wine to come in more contact with oxygen. Oxygen, during its initial contact with a wine can be very helpful, enhancing a wine’s flavors and softening it. Think about the wine being “caught” in the bottle, tightly stoppered under cork and capsule, a sleeping genie. Decanting wakes the wine up, helps it snap to attention and introduce itself with vigor. 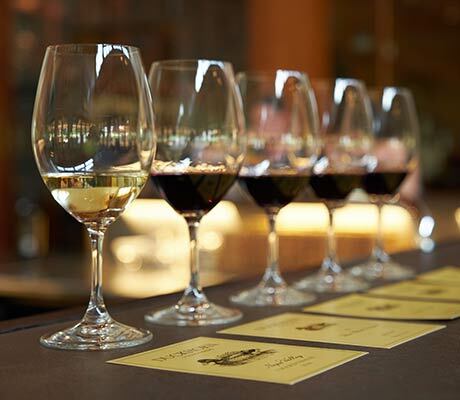 Older red wines naturally produce sediment as they age (white wines rarely do). The color pigments and tannins bond together and fall out of solution. Stirring up the sediment when pouring will cloud a wine’s appearance and can impart bitter flavors and a gritty texture. The sediment is harmless but it’s not pleasant to get this material in your glass or worse in your mouth. It’s safe to assume that a red wine will have accumulated sediment after five to ten years in the bottle and should be decanted. Set the bottle upright for 24 hours or more before drinking, so the sediment can slide to the bottom of the bottle, making it easier to separate. This advice assumes that the bottle was stored properly, cork down or on its side. Locate a decanter or other clean, clear vessel from which the wine can easily be poured into glasses. Decanters can be extremely elaborate or quite simple. The best models are dishwasher safe, easy to handle and to store. A simple glass pitcher will work just fine. Remove the wine’s capsule and cork; wipe the bottle neck clean. Pour the wine into the decanter slowly and steadily, without stopping; when you get to the bottom half of the bottle, pour even more slowly. Stop as soon as you see the sediment reach the neck of the bottle. Sediment isn’t always chunky and obvious; stop if the wine’s color becomes cloudy or if you see what looks like specks of dust in the neck. The wine is now ready to serve from the decanter. Discard the remaining ounce or two of sediment-filled liquid in the bottle. 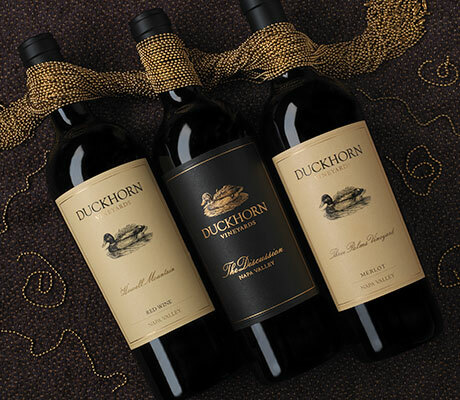 Duckhorn Vineyards makes several age-worthy wines. Most famously, our Three Palms Vineyard Merlot and Howell Mountain Cabernet Sauvignon have the character and substance to gracefully age over a decade. The fortunate wine lover about to open and enjoy one of these wines with a significant bottle age should approach the task with a decanter in hand. Decanting will ensure elegant service as well as invigorate the wine’s flavors and aromas. At the other end of the spectrum, new release wines can be “tightly wound” in their infancy. It is remarkable what happens to an introverted, shut down wine after as little as an hour spent out of the bottle and in a decanter. A wine that seemed somewhat dull and tight will suddenly awaken and have lots more to say! Now you know much more about this useful component of my favorite participatory sport. Decanting isn’t fussy or mysterious, simply practical and beneficial. Every bottle of wine has a story to tell, and that story begins in the vineyard. With each vintage, the unique interaction between terroir, climate, and weather dictate the narrative of each bottle. So, in this blog we will examine the lifecycle of the grape vine, the ultimate wine author. Come spring the vines reawaken from dormancy. From March to April the vines experience bud burst. From these buds, green leaves burst awake in preparation for photosynthesis with the warmer months. Bud break is a delicate time, as the new growth is in danger of spring frost and hail storms. 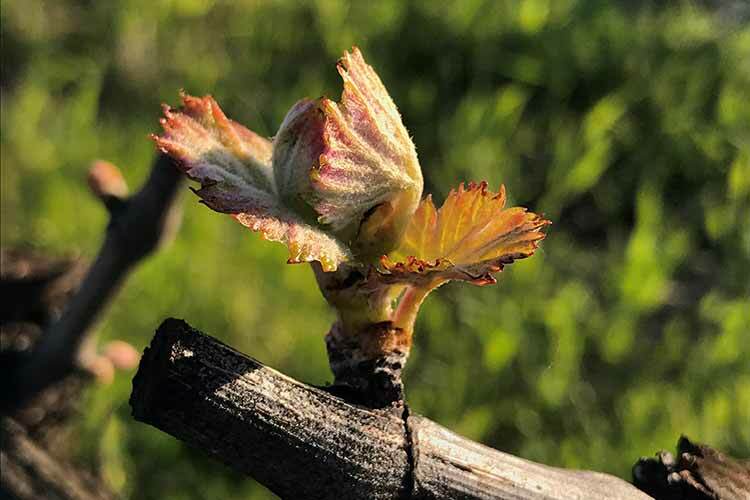 As bud break turns into vegetative growth, the next process of the grape vine begins from April to May. 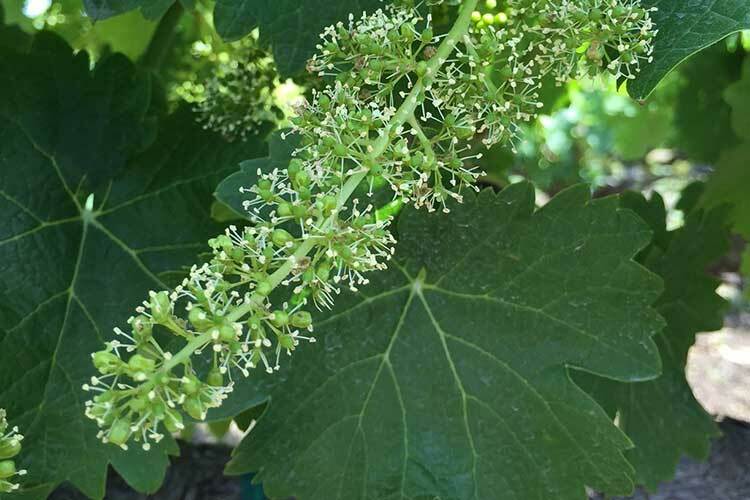 Flowering is when bunches of tiny flowers bloom from the new vine shoots. Grape vines are self-pollinating, so each of these flowers has the potential to turn into a single berry. As the summer months set in, the pollinated flower drops its petals and tiny green grape berry clusters with seeds develop at the end of the stem. Although, not every flower is fertilized into a berry, so it simply falls off the vine. The fruit set stage of the grape vine is critical, as it becomes the initial indicator of the potential crop yield in harvest. Come mid-summer, the green berry clusters begin to expose their color pigmentation. 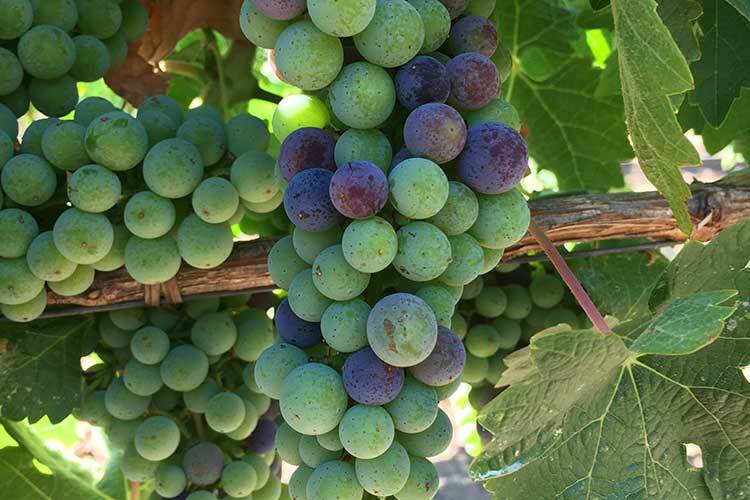 Verasion is the process in which the berry clusters begin ripening and turning purple or blueish in color. The heat of summer induces sugar development and ripening in each grape, while the cool evenings (depending on growing region) preserve natural acidity and freshness. From September to November, for winemakers, viticulturists and wine country visitors, this is the most exciting time of the wine growing season! 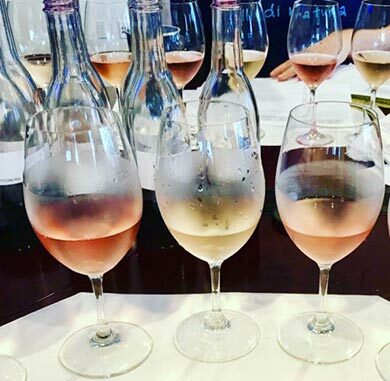 There is a palpable buzz and energy as winemakers’ taste, test, and measure brix, or sugar content, and determine when the grapes are ready to be picked. Harvest is when the grapes have reached optimal ripeness and are ready to tell the story of the vintage. After the seasons fruit has been collected during harvest, all fall leaf foliage falls to the soils and the vines go dormant. During this time, viticulturists are diligently pruning each vine in an effort to guide vine growth for next season. After four months of rest, the grape vine repeats this process effectively growing and telling the story of another season. Harvest is the best season to visit wine country! The vines are lush with green foliage and plush purple grape clusters create the most picturesque visit. Our annual Paraduxx X2 Release Harvest Party took place on Saturday, September 29th! If you missed the festivities you can still book your fall reservation at Paraduxx, Duckhorn Vineyards, Goldeneye and Calera today! It is officially summer and time to head outside for your dose of Vitamin D! When the Events Team is not busy dreaming up the next Duckhorn Wine Company event, we are crafting our own al fresco adventures. Follow these three easy steps below to picnic like a pro. 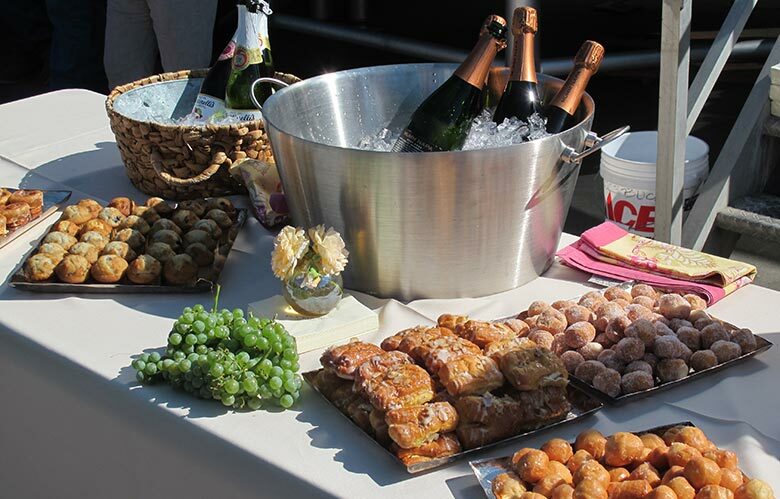 With the busy work week weighing on many of us, it can seem daunting to put together a well-organized weekend picnic. Lessen your stress, and put together a picnic-edition “bug-out” bag before the summer season starts. Keep a check-list of items included in your basket, use and replenish when you’re ready to hit the road again. The time is now to enjoy your summer sippers! Pack the right wines and serve at the right temperatures to pair perfectly with your al fresco provisions. 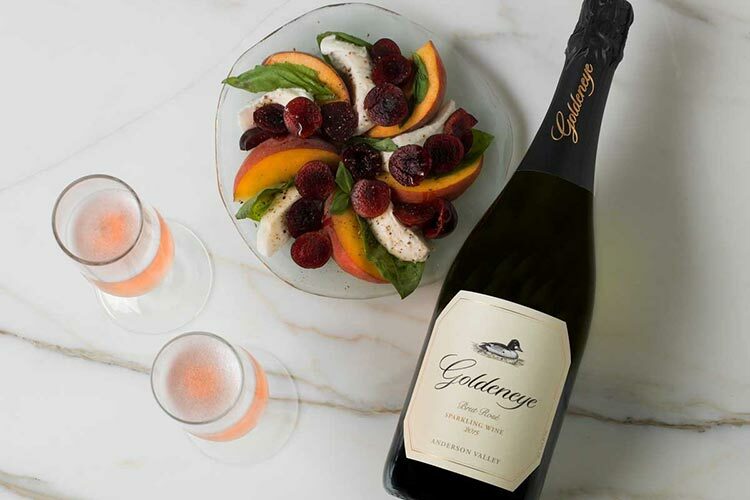 Our favorite picnic pairings include Duckhorn Vineyards Napa Valley Sauvignon Blanc, Paraduxx Napa Valley Rosé and Goldeneye Anderson Valley Pinot Noir. Avoid the charcoal smudges and sandy-sandwiches, prep all foods in advance to be enjoyed at ambient temperature. 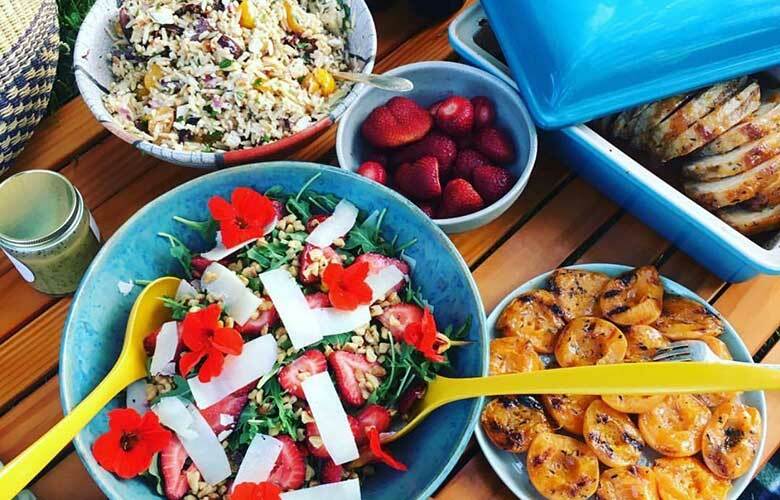 With less on-site prep work, hosts can make the most of their weekend adventures too. Ready to let someone else do the heavy lifting? 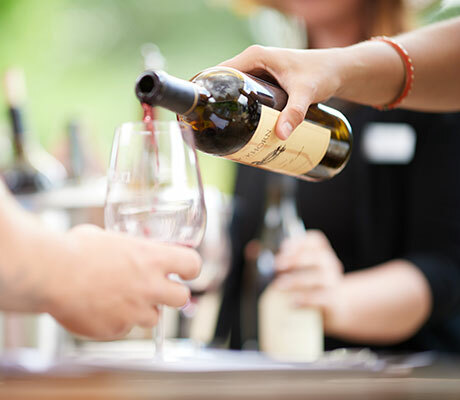 The Duckhorn Events Team extraordinaire is ready to host your next wine country experience. Learn more about planning your next weekend adventure with our team. 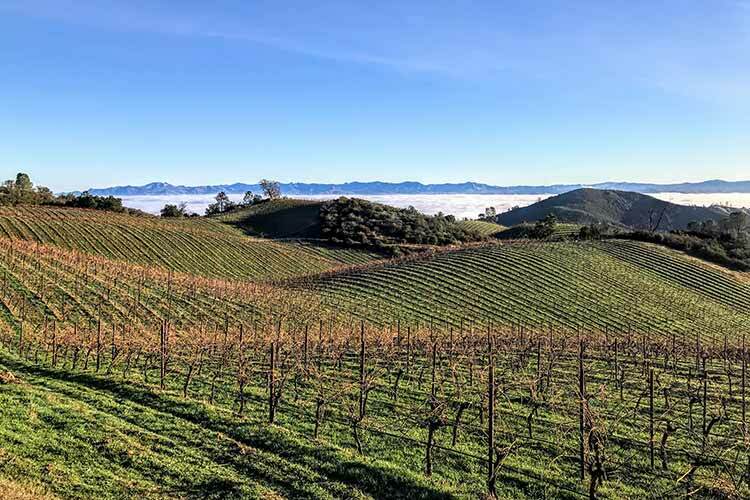 Forty years ago, Dan and Margaret Duckhorn along with their winemaker had a passionate discussion at the dinner table about making a cuvée, or the finest red blend. 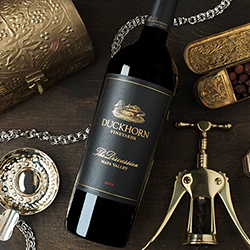 Instead, they chose to focus on varietal wines, yet Duckhorn Vineyards had remained intrigued by the artful blend of a cuvée. 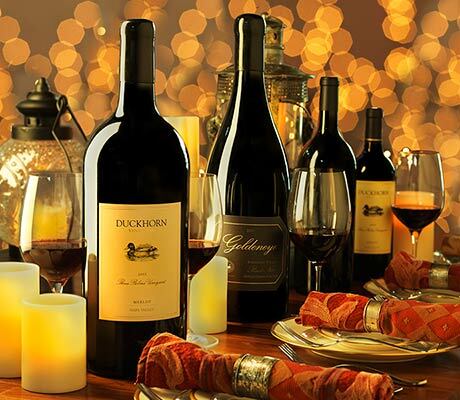 In 2006, that dinner discussion from 30 years ago came to fruition; Duckhorn Vineyards released their first cuvée or pinnacle wine aptly named, The Discussion. 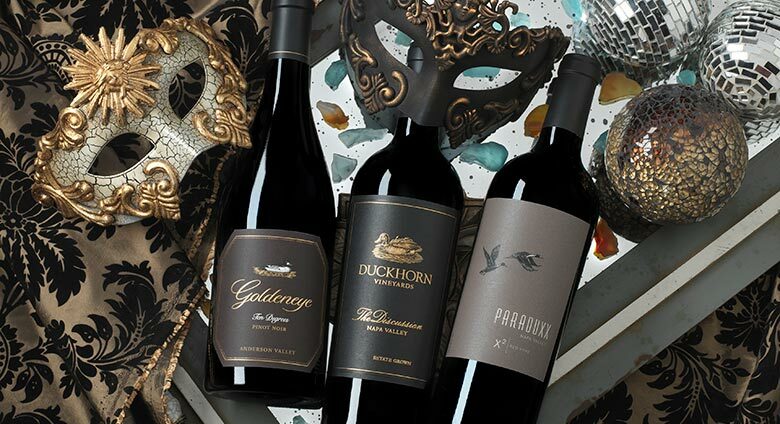 Today, within the Duckhorn Portfolio, there are four Pinnacle wine offerings from four of our seven wineries, Duckhorn Vineyards, Paraduxx, Goldeneye and Canvasback. These wines are 100% estate grown and celebrate our best blocks from our top estate vineyards. Our four pinnacle wines are distinctly different and capture the essence of each winery and region. 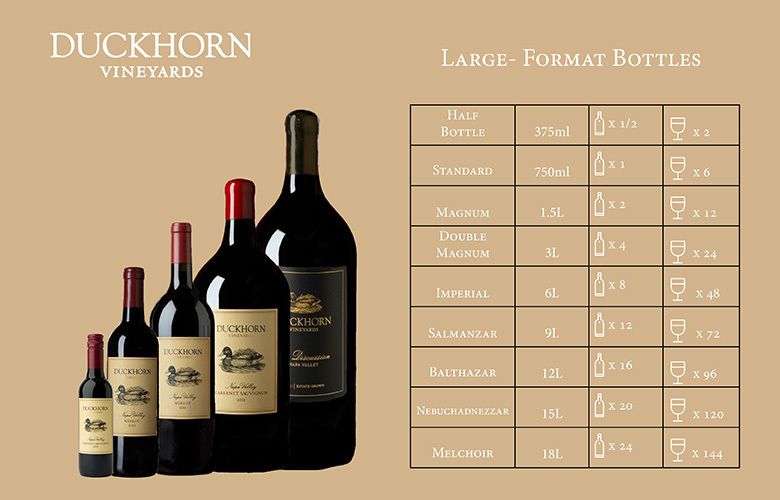 The Discussion from Duckhorn Vineyards is classic and elegant embodying the best of Napa Valley Bordeaux varietals. Paraduxx X2 stylishly blends mountain fruit and valley floor fruit, beautifully demonstrating the subtle art of the blend. 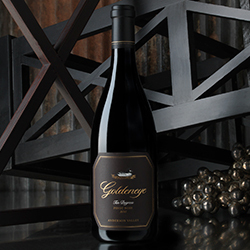 Our pinnacle Pinot Noir, Ten Degrees, from Goldeneye is complex, earthy and rustic, perfectly capturing the natural intensity of Anderson Valley. The Grand Passage is concentrated and complex, beautifully embodying the desert-like climate of Red Mountain in Washington State. All four of these wines are ready to drink now and ideal for aging in your cellar for 10 to 15 years. The Discussion commemorates a longstanding dream of Dan and Margaret Duckhorn’s. The primary blend is always Merlot and Cabernet Sauvignon, representing our belief in the timeless union of these two noble Bordeaux varietals. 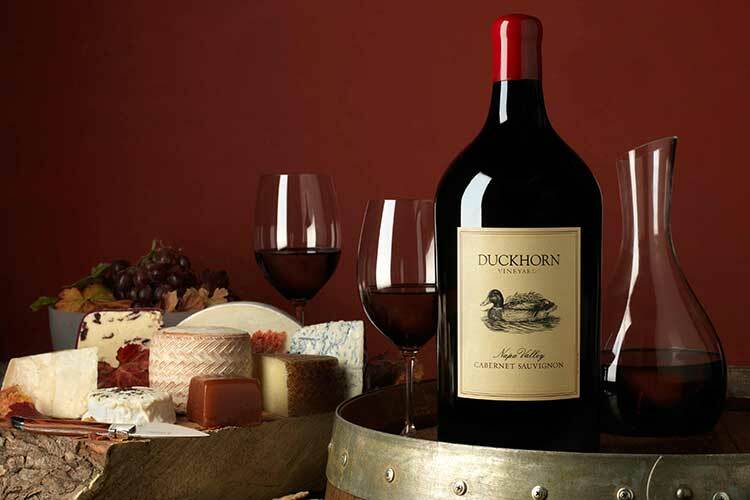 The Discussion embodies the depth and complexity of Duckhorn Vineyards renowned estate program, resulting in an elegant wine with pure fruit flavors combined with silky tannins and savory notes. X2 is crafted as an exponential expression and harmonization of our Paraduxx style and the pinnacle of our portfolio. 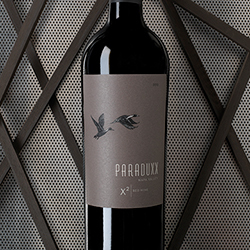 Paraduxx X2 is a blend of our best blocks and barrels selected from our finest estate grown Cabernet Sauvignon and Zinfandel producing a wine that balances depth and structure of mountain grapes with the lush vibrancy of valley floor fruit. Made from our ten finest barrels of Pinot Noir, we name this special wine Ten Degrees – a name that pays homage to the fact that our three estate vineyards in Anderson Valley display as much as a 10 degree temperature variance, while spanning only an eight-mile distance. As the pinnacle wine of our portfolio, Ten Degrees combines our best estate vineyard grapes and showcases the elegance, beauty and rustic characteristics of the Anderson Valley. 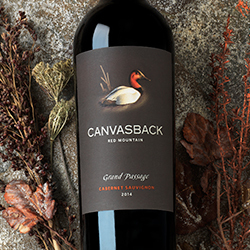 With access to some of the best vineyards in Red Mountain, Canvasback was able to craft Grand Passage, the pinnacle of our winemaking program. The Grand Passage is 80% Cabernet Sauvignon and 20% Merlot, it embodies the finest blocks and barrels of each vintage to create a beautifully layered wine with ripe voluminous dark fruits rounded with notes of mocha and salted caramel and polished tannins. This is a Cabernet lovers’ prefect wine! Sometimes a standard gift bag just doesn't cut it. If you're feeling creative and want to go the extra mile when styling your wine gift, here's a fun option for the crafty at heart. 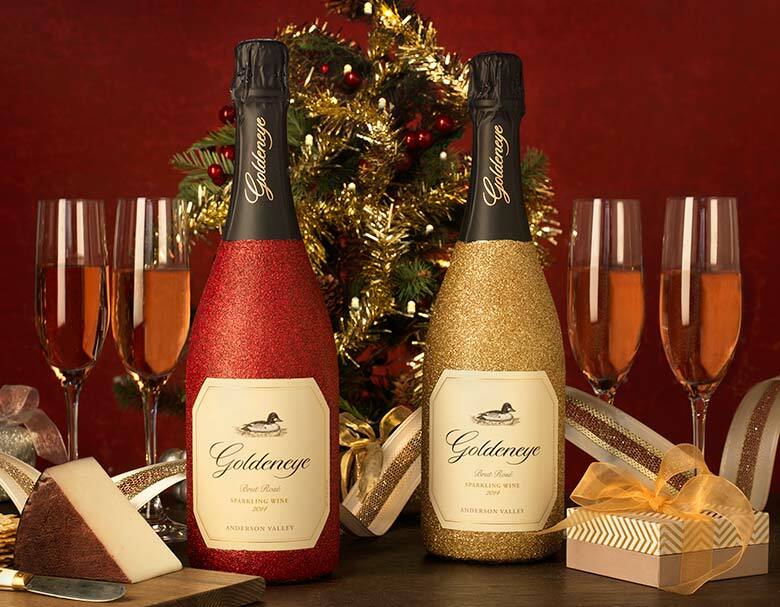 With a foam brush, cover your bottle of Goldeneye Sparkling Wine with craft glue. Be extra careful around the label. Next, using extra fine glitter in your favorite color, sprinkle gently over the glue. Let the first layer dry for about an hour, then repeat until you're pleased with the coverage. To seal the glitter, add a layer of watered down craft glue and set aside to fully dry. Whether this lovely bottle is a gift for someone special or something just for you, it's guaranteed to be a hit both before and after you open it. Each harvest season is a blank canvas and the winemaker is given the opportunity to paint the perfect vintage! As Decoy begins its twenty-second harvest, I sat down with Winemaker Tyson Wolf to discuss the 2017 vintage. With the heavy rains this year, the question on everyone’s mind is how is the vintage looking? Our winemaker says the grapes are superb, with his first pick being of Sauvignon Blanc from the Alexander Valley. Fortunately, August has seen consistently warm weather which is balancing out the moisture brought on by California’s out-of-character rainy season. 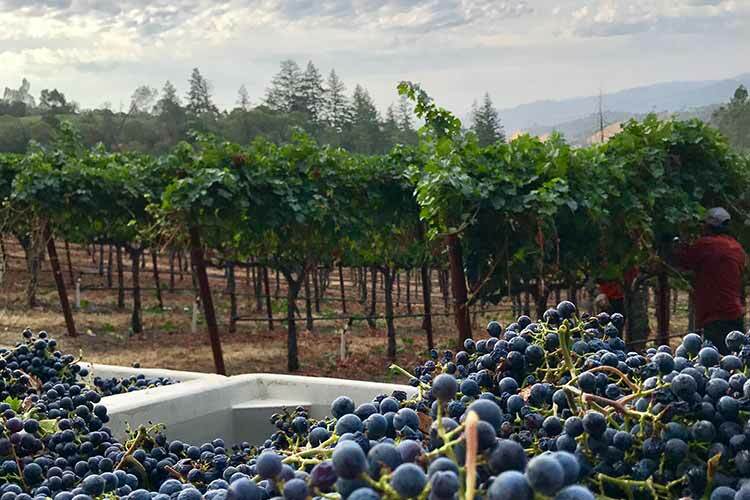 The excitement of Harvest is visible throughout Sonoma wine country! Harvest is a culmination of the year’s climate and local geology, bearing fruit that is evocative of a place. According to Tyson, Harvest is the most important part of the winemaking process, setting a tone for the entire year of winemaking. It all starts with picking the grapes! Knowing when to pick each block of grapes is a skill. 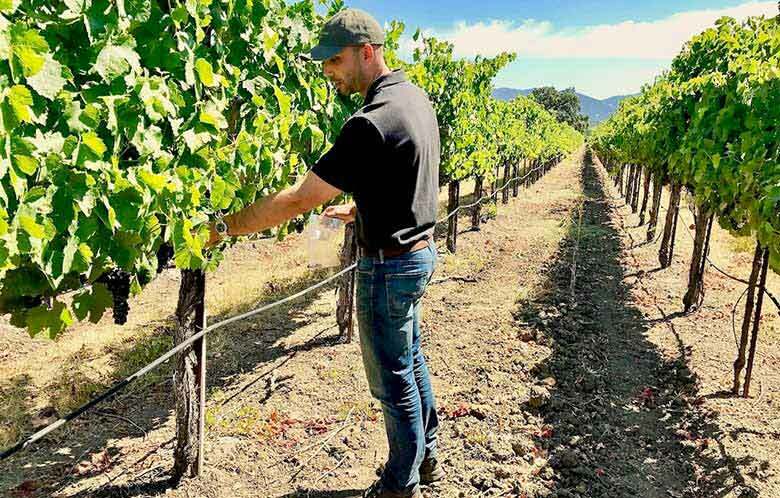 For Tyson, grape picking involves an analysis of not just the grapes chemistry but also of its flavor profile as well as an evaluation of how the flavor will continue to develop. It involves having the foresight to taste a single grape and understand how that grape will translate to the finished product, in the bottle! Tyson's personal challenge every year is to make each vintage better. He and his team frequently taste the past two vintages and decide how to tweak the wines to achieve the ideal translation of the given varietal. For instance, Tyson is most excited to play with the second vintage of Decoy Rosé and add more Syrah to create a brighter, crisp Rosé with exotic fruit notes. From the picking of the grape, to the blend and barrel regime, winemaking most certainly is a labor of love. 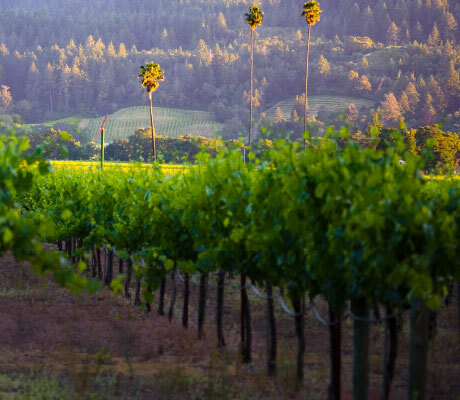 Decoy wines aim to translate a sense of place, transporting the wine taster to Sonoma County and imparting a tasting experience that is much more than just the fruit, oak, and spice. Tyson says part of the fun of growing and making wines in Sonoma County is the diversity of climates. The Pacific Ocean offers a marine influence with cool coastal winds and morning fog while another microclimate exists that is warm, dry and mountainous. 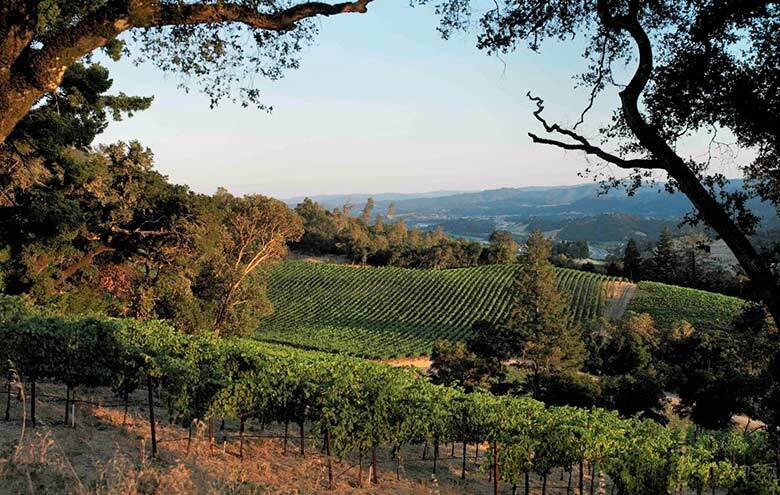 Sonoma County is unique in that it is able to communicate a variety of terroirs! Cheers to the 2017 vintage and to a successful Harvest!